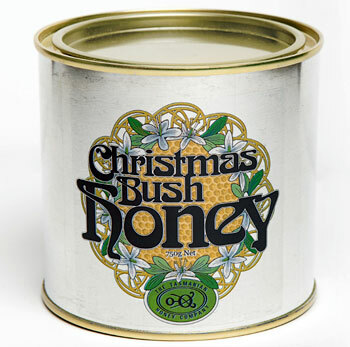 Christmas Bush Honey...a rare one-of-a-kind 'Special Reserve Honey'. Tasmanian Christmas Bush Honey is produced from the Bursaria plant, a prickly bush covered in millions of tiny white flowers in the shape of bursting stars....a plant found nowhere else in the world. Christmas Bush Honey, produced by the Tasmanian Honey Company, is one of nature's most unique gifts. Tasmania honey is naturally organic by virtue of the fact of where it is produced..from the unspoiled, pristine ancient rainforests located on the remote western side of an even more isolated, primitive island, Tasmania. The Christmas Bush Honey is neither heated or filtered...a pure raw honey. As the honey is packaged straight from the extractor it may contain small bits of beeswax. Mellower than the Leatherwood Honey, the flavor characteristics of the Christmas Bush Honey are soft, slightly herbaceous, with undertones of marzipan. From the bees gathering pollen from the flowers of the Bursaria plant that flowers just in time for Christmas, comes the perfect Holiday gift for the foodies on your list! Produced only in Tasmania, Australia. Decorative resealable tin with a unique vintage-style floral design (Christmas Bush White Flowers).